Market measures consist of weighted values of the components that make up certain lists of companies. The stock market index tracks the performance of certain stocks by weighting them according to their prices and the number of outstanding shares using a particular formula. The Commodities (Price) Index assigns weighted averages to such commodities as energy, precious metals, base metals or futures contracts known as ‘softs’. 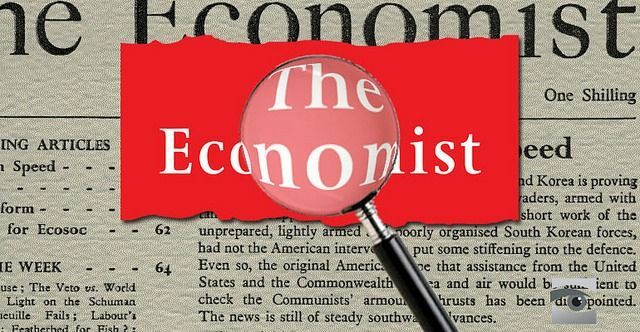 In different columns you may also see The Economist ‘Commodity Price Index’ and the ‘Markets’ index. ‘Gross’ means that depreciation of capital stock is included. Without depreciation (that is, with net investment instead of gross investment), it is the net domestic product. Consumption and investment in this equation are the expenditures on final goods and services. The exports minus imports part of the equation (often called net exports) then adjusts this by subtracting the part of this expenditure not produced domestically (the imports), and adding back in domestic production not consumed at home (the exports). This is a key economic indicator that relates to the total output of all factories, mines and utilities. Monthly percentage changes in the index reflect the rate of change in output. Changes in industrial production are widely followed as a major indicator of strength in the manufacturing sector. This is what people are usually thinking of when they worry about inflation. This is the price paid by whomever finally consumes goods or services, as opposed to the price paid by companies at various stages of the production process (see, for example, factory prices). This represents people who were not employed during that week, but who were actively seeking work, waiting to be called back to a job from which they were laid off, or waiting to report within 30 days to a new payroll job. This is a measure of the number of workers that want to work but do not have jobs. Foreign exchange reserves are the foreign currency deposits held by central banks and monetary authorities. These are assets of the central banks which are held in different reserve currencies, such as the dollar, euro and yen, and which are used to back its liabilities; for example, the local currency issued, and the various bank reserves deposited with the central bank by the government or financial institutions. The purpose of reserves is to allow central banks an additional means to stabilise the issued currency from excessive volatility, and protect the monetary system from shock, such as from currency traders engaged in buying an asset and quickly reselling (or ‘flipping’) it for profit. Large reserves are often seen as a strength, as they indicate the backing a currency has. Low or falling reserves may be indicative of an imminent bank run on the currency or default, such as in a currency crisis. This is the amount of money (coins, paper currency and cheque accounts) in circulation in the economy. If there is too much money in the economy, interest rates tend to go down while inflation tends to rise. Conversely, if there is too little money in the economy, interest rates tend to go up and prices and production tend to go down. This can cause unemployment and idle plant capacity. The balance of trade figures is the sum of the money gained by a given economy from selling exports, minus the cost of buying imports. They form part of the balance of payments, which also includes other transactions such as the international investment position. This very important figure is the difference between the nation’s total exports of goods, services and transfers and its total imports of them. Current account balance calculations exclude transactions in financial assets and liabilities. The current account balance helps a country to evaluate its competitive strengths and weaknesses and to forecast the strength of its currency. This is the same as the exchange rate in US dollars over two time periods. This measures how much of the annual GDP is made up by the government’s budget. This is the cost of borrowing money, expressed as a percentage, usually over a period of one year. For example, when the mortgage balance is $100,000, and the interest rate is 6 per cent, one single annual payment will include $6000 interest. Key components of retail sales include cars, building materials, furniture, department store sales, food store sales, petrol, clothing, restaurant sales and pharmacy sales. High retail sales are an indication of economic growth and an expanding economy. In commerce, a retailer buys goods or products in large quantities from manufacturers or importers, either directly or through a wholesaler, and then sells individual items or small quantities to the general public or end-user customers, usually in a shop/store. Retailers are at the end of the supply chain. Marketers see retailing as part of their overall distribution strategy. This measure contains data on prices by stage of processing, sector, industry and commodity. Price increases that wholesalers and manufacturers are paying now cause consumer price increases in products and services later. A wage is the amount of money paid for some specified quantity of labour. When expressed with respect to time (usually per hour), it is typically called the wage rate, and is specified in pre-tax amounts. It is often the main monetary item upon which the worker and the employer focus when negotiating an employment contract. This is a given country’s exchange rate with the currencies of its trading partners weighted by the amount of trade done by the country in each currency. A trade-weighted currency index is a weighted average of a basket of currencies that reflects the importance of a country’s trade (imports and exports) with these countries. Sometimes a trade-weighted currency index is taken as a crude measure of a country’s international competitiveness. 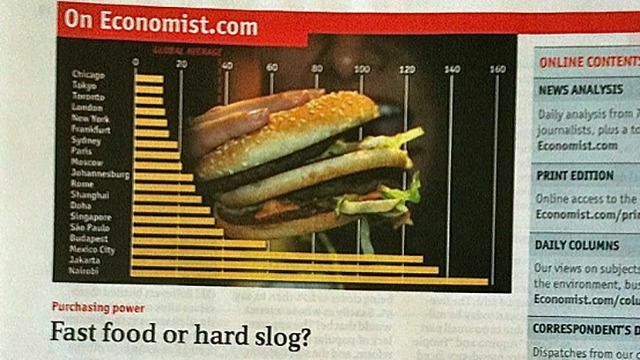 The Economist’s shameful burger graph. 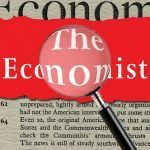 ‘Burgernomics’ is based on the theory of purchasing-power parity (PPP), the notion that a dollar should buy the same amount in all countries. Therefore, in the long run, the exchange rate between two countries should move toward the rate that equalises the prices of an identical basket of goods and services in each country. Our ‘basket’ is a McDonald’s Big Mac, which is produced in about 120 countries. The Big Mac PPP is the exchange rate that would mean hamburgers cost the same in America as abroad. Comparing actual exchange rates with PPPs indicates whether a currency is undervalued or overvalued. Which world share market is doing best right now? Which stock (share) has dropped the most? How is the price of cocoa tracking? What are the trends in world oil prices? What is the price of one barrel of West Texas Intermediate crude oil? Which country has the highest predicted increase in GDP from this year to next? Which country has the lowest GDP growth and which has the highest? Which region of the world has the lowest industrial production? Which country has the highest and which has the lowest trade balance? Which country has the highest budget balance as a percentage of GDP? Based upon interest rates, where would you ideally invest your money? Which country, Australia or New Zealand, is doing better in retail sales volume? In which country, Australia or New Zealand, is a Big Mac sold at the best value? Which country in the world has the ‘worst’ price for a Big Mac? Make up five more questions that could be added to this exercise and add them to the comments.